Rear-wheel drive, a compact design and high performance are just some of the strengths of the Jungheinrich EFG 110-115 series of forklifts. 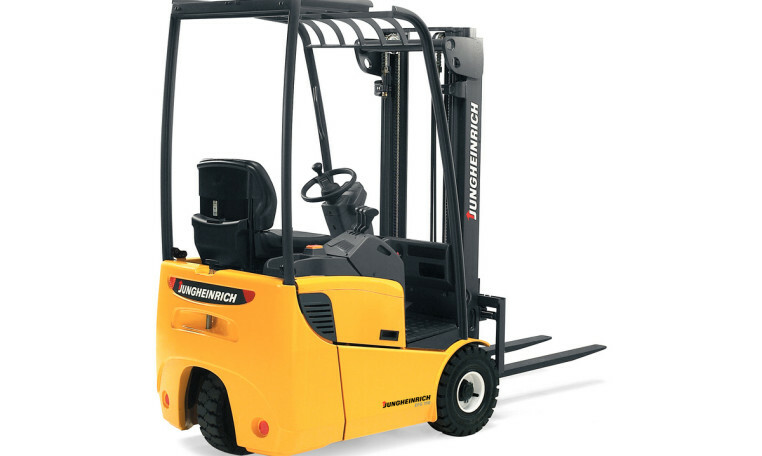 This forklift has greater maneuverability and excellent performance in restricted spaces due to its compact dimensions. Designed with rear drive, the EFG series of lift trucks can turn within its own footprint. The enclosed AC motors enable smooth acceleration, making this forklift suitable for a variety of applications. The EFG 1 series of forklifts has exceptional productivity due to the comfortable operator compartment, high performance characteristics and low life-cycle costs. Lift heights up to 177 inches on the EFG 115 forklift and 196 inches on the EFG 110k/110/113 forklift series can be achieved without reducing nominal capacity. This is due to excellent stability. Drive and lift motors with AC technology and excellent heat management (no fans required). Standard high overhead guard for superior headroom. Clear view: mast and fork carriage allow for excellent operator visibility to the forks. Comfortable, fatigue-free operation of travel direction and hydraulics by SOLO-PILOT or MULTI-PILOT (optional) controls. Hydraulic power steering is precise and low-effort (5.2 turns for 180° angle of lock). Single-piece metal cover ensures quick and easy access to the forklift's battery compartment. Maintenance-free and wear-free AC motors. Fully enclosed motors and electronic components comply with IP 54, protecting against dust, dirt and moisture ingress. Prolonged service intervals: every 1,000 operating hours or every 6 months. Hydraulic pinion gear steering eliminates the need for chains. AC technology ensures exceptional performance. Significantly longer work cycles, increasing the intervals for charging. Progressive lowering brake valve allows for a consistent lowering speed with and without a load. Programmable performance parameters ensure maximum flexibility. 5 drive programs can be individually selected and adjusted (optional). Curve Control reduces forklift travel speed when cornering. SOLO-PILOT (standard equipment) combines the direction switch, horn, and the forklift's lifting/lowering function in one control lever. Additional functions, such as forward/backward tilting, sideshifting (optional) and auxiliary hydraulics (optional), can be operated with additional levers placed directly next to the lift/lower lever. MULTI-PILOT (optional) combines all hydraulic functions in one joystick. All functions are easily controlled with minimal hand movements. The adjustable armrest (optional) and ergonomically-positioned handle provide support to the operator’s arm and hand. Controlling several functions at once is quick and easy with the MULTI-PILOT. Fully enclosed, brushless AC motors are the key components of the forklift's low maintenance drive unit. They are resistant to dust, dirt and moisture. The temperature control protects the motors from overheating by adjusting the performance.